The AWWP Love and Forgiveness Curriculum Is Here! 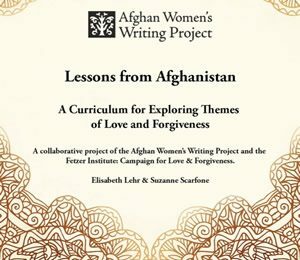 Lessons from Afghanistan: A Curriculum for Exploring Themes of Love and Forgiveness is hot off the presses and ready to be shared. A collaborative project of the AWWP and the Fetzer Institute’s Campaign for Love and Forgiveness, we seek teachers, writing group leaders, and facilitators of all stripes and interests who might be interested in exploring the lessons crafted by educators Elisabeth Lehr and Suzanne Scarfone. We provide the curriculum free of charge. or powerless, or immature, or poor. by AWWP | July 29, 2013 | Campaign for Love and Forgiveness, curriculum, Latest Poems, N.
by AWWP | July 25, 2013 | Campaign for Love and Forgiveness, Latest Poems, N.
The voice of love and passion. Our prophet Mohammad said, “If my nations have animosity more than three days, they are not my nations.” So if someone makes mistakes, we should not allow animosity longer than three days. I say Allah Hafiz to everyone. Without you, my beloved, I am silent, without laughter or speech. to help you, make you strong. by AWWP | June 14, 2013 | Campaign for Love and Forgiveness, Latest Essays, N., Sara, Yalda J. When readers from all over the world read my words, I am understood as a woman. When Afghans work together to bring peace in Afghanistan, love catches me. Because you are love, honesty, and sentiment.